The war continues and a new, secret, front is emerging as a threat to both the Coco’s and Frosted Flakes. As Dylan and Hunter learn more about the war, they are less eager to continue fighting—but the hope of finding their friend pushes them to continue. 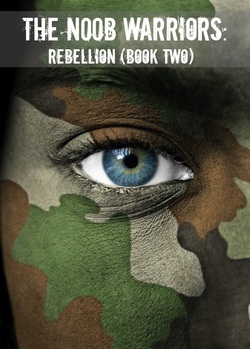 Dylan learns quickly that in the Rebellion, there are no heroes; everyone has scarified everything to flee the enemy. If he wants to continue in the Rebellion, then he’s going to have to work hard and fight harder to earn respect. Dylan looked at the black smoke in the distance; the signal that was all clear. He turned around where Hunter steadied himself against a tree; his leg was bloody. A rag was tied around his calf, and a piece of tape held together the right side of his glasses. His eyes looked teary. His coke bottle glasses were smeared with dirt and sweat, and his blonde hair was full of chunks of mud. “I screwed up,” Hunter softly cried, “I’m sorry.” He removed his glasses and wiped his eyes. Dylan nodded, “He can walk.” Hunter had grown over the past several months; he was now almost as tall as Dylan, who had yet to have any real growth spurt and was still shorter than most kids his age. He had also gotten bulkier from lifting weights and was starting to look like one of the jocks that Dylan had always despised. Dylan had trained just as hard, but had remained largely unchanged. He was convinced that it was in his genes to be puny. Despite Hunter’s growing size, Dylan still treated him like a child. “Are they going to have to cut it off?” Hunter asked sobbing again, this time more noticeably. “Stop being such a jerk, Dylan.” Trista said, pulling his hand off Hunter’s and standing protectively in front of him. “We all mess up. No one got too hurt, we all live to see another day, just let it go.” She looked towards the sun and knew it wouldn’t be light out for long. Before Trista could reply, a hand came over Dylan’s mouth muzzling him; instantly he saw men dressed in dark fatigues doing the same to Trista and Hunter. Their faces were covered, along with nearly every part of their skin. “Very much.” They had left their food at the house of the man who shot Hunter. That was the day before. It had been nearly a day with no food or water; their only saving grace was it wasn’t summer. Dylan, Trista and Hunter followed the group to two beat jeeps in the distance. “Name's Charlie, by the way.” The teen said as they walked. “You don’t look like a Charlie.” Trista said. “A little in school.” Trista replied. Dylan looked at the keys confused. “I can do it,” Dylan assured Trinity. Dylan got behind the wheel and started it. “Some old man...” Dylan started to say, but Charlie cut him off. “The car lights.” The sun had almost set and Dylan had to squint to make out the jeep ahead. Within thirty minutes, it was completely dark. Dylan had lost sight of the first jeep over twenty minutes ago. It was complete blackness except for the stars in the sky. “Really is peaceful, huh?” Charlie lit a cigarette, which provided brief light. “I can’t drive like this!” Dylan finally said slowing the jeep. “Where are we going?” Hunter, who had not said anything since Charlie had scolded him, asked, confused. Before Charlie replied, the jeep crashed and everyone was tossed forward. Charlie’s head hit the dashboard, but Dylan had slowed down enough earlier not to do any serious damage. “So now what?” Trista asked. “At least we are the good guys.” Hunter said.